The first Rowton House, at Vauxhall, which opened in December 1892, was personally financed by Lord Rowton. Following its success, a limited company was formed to expand the scheme. 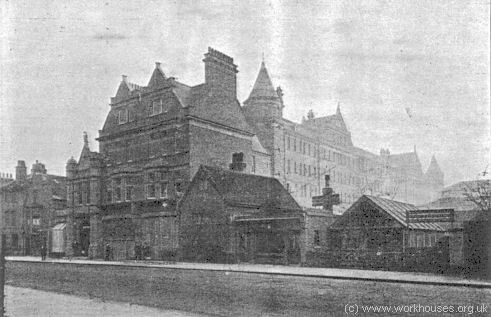 The Hammersmith Rowton House, at 221 Hammersmith Road, was the fourth to be built — it opened on 2nd December 1899 with 800 beds. The location of the site is shown on the 1916 map below. Hammersmith Rowton House site, 1916. Hammersmith Rowton House entrance, 1899. 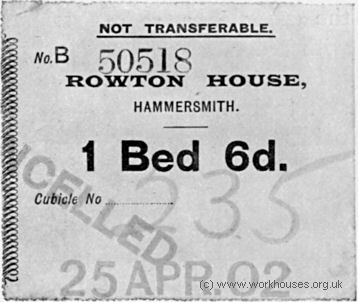 Hammersmith Rowton House admission ticket, 1899. 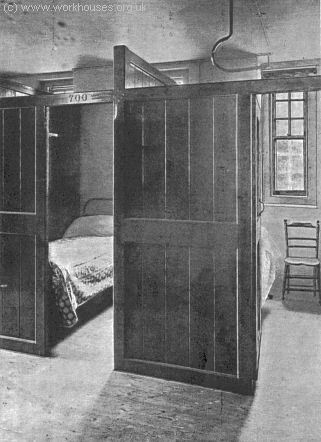 Hammersmith Rowton House bedroom cubicles, 1899. SATURDAY last saw the opening of the fourth Rowton House in London. This one has been given a commanding position in the Hammersmith-road, not far from the railway station, and it provides no fewer than 800 separate cubicles. It is considerably larger than the Vauxhall Rowton House, which has only 475 cubicles, or the King's-cross Rowton House, where there are 677 cubicles. The other, which stands in Newington-butts, is a trifle larger, having accommodation for 805 men. The fifth Rowton House, for which plans have already been prepared, will be the largest of all. It is to be built in Whitechapel. There is some talk also of a Women's Rowton House, for which £50,000 has been guaranteed by women interested in the movement. The new premises in Hammersmith have been fitted with all the completeness of the other houses. There are dining-rooms, a smoking-room, a reading and writing room, bath-rooms, a shoemaker's shop, lodger's store rooms and lockers - all on the ground floor or basement. Three stairways admit to the cubicles above. Not only have the lodgers bath-rooms; there is a dressing-room provided in the bath corridor to enable lodgers to change their garments during the hours that access is not permitted to the cubicles. A special washhouse is provided for the use of lodgers who may wish to wash their own garments. 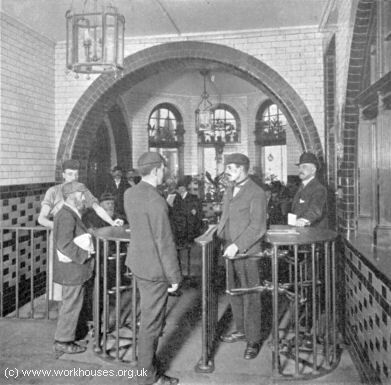 The walls are of glazed bricks, and the place is fitted with ten washing troughs in ivory glazed fireclay, hot and cold water supply to each, and a large heating stove, surrounded by a galvanised iron framework for the speedy drying of garments. The lavatory is a specially large room, where eighty men can wash at the same time. Each basin is supplied with hot and cold water, and towel and hat rails adjoining. Opening out of the lavatory is a feet-washing room, with eight troughs divided by teak boards. On the other side of the lavatory are the shoemaker's and tailor's shops, adjoining which a space has been specially fitted out for the lodgers to clean their clothes and boots. Chief in this connection is the reading-room. A good assortment of books is provided, although the superintendent must be appealed to before a book can be removed from the shelves. The books are stored in cases with glass doors, so that the titles can easily be read from the outside. A lodger need but to mention the book he wants, and he secures it for the evening. The tables here will seat some 176 men, while any number of others can make use of the easy chairs, and gather round any one of the four large fire-places. The pictures on the walls, here as everywhere else in the building are of an artistic kind, though one could wish they had not all been framed alike. Next to the reading-room, nearer the entrance, is the smoking-room, with table accommodation for 164 lodgers, and plenty of easy chairs. There are three fire-places with overmantels. A large fire-place bay window gives view into a courtyard. The lodgers have also a smoking-lounge in the open air. It occupies the whole of the frontage opposite the dining-rooms, and has a sheltering roof. Nothing has been forgotten in the way of providing for the lodgers comfort at meal times. Two spacious dining-rooms have been provided, and in one of them is the shop where the lodgers can buy well-nigh anything in the way of eatables and drinkables, from sums ranging from a farthing to a penny. The shop holds a tobacco licence. 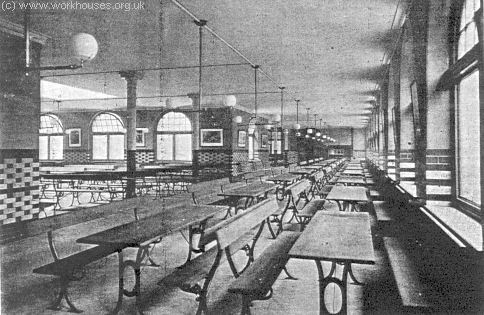 Seating at tables is provided in the two dining-rooms for 464 men, and in addition a number of extra seats and wooden easy-chairs are available. Four large cooking ranges, with ovens, hot-plates, and grills, are at the lodgers' service, and boiling water can always be had for making tea. A scullery is placed between the two dining-rooms, to enable lodgers who wish to prepare their own food for cooking to do so out of the dining-rooms. Another room is reserved for keeping crocking, cooking utensils, teapots, and the like. Lodgers who cook their own food have the free use of all the things here. They are not expected to clean them. The various articles are left in the dining-rooms after use, and afterwards collected by the attendants. As to the bed rooms or cubicles, the whole 800 of them are accommodated on five floors. Each bed is in a separate cubicle, with a window to each as well as a chair, shelf, and clothes hooks. The cubicles are approached by three fireproof staircases, built in ivory glazed brickwork, two situated at the south boundary of the site, one adjoining the office, and all at the extreme ends of cubicle corridors. The disposition of the staircases renders it an impossibility to be trapped by fire, in the event of an outbreak, as the cubicle corridors run from staircase to staircase, thereby leaving open a way for retreat in the event of access to one staircase being blocked. In addition, each floor is divided by divisional walls into eleven sections, which would check, if not stop, the progress of a fire horizontally. The sectioning of the floors also enables isolation and efficient fumigation in the event of a case of contagious disease. 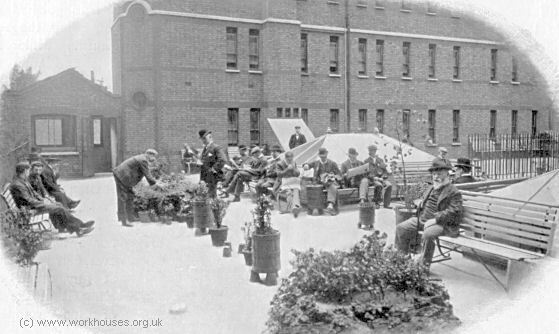 Hammersmith Rowton House inner courtyard, 1899. 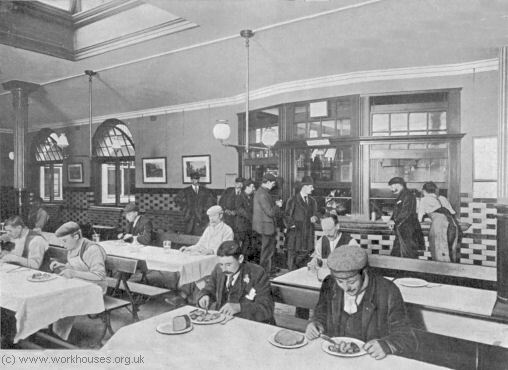 Hammersmith Rowton House dining hall, 1899. The Hammersmith Rowton, then known as Butterwick House, closed in April 1972, with the building being demolished in a subsequent redevelopment.